College can be tough. And UC Berkeley student Yurie Iwako has borne an extra layer of anxiety — one that left her afraid to cross the street midblock when she was late for class, to go to a club with friends or ride a bike and perhaps run a stop sign by mistake. “What if I’m in the wrong place at the wrong time?” was the question that kept her on edge, because Iwako is an undocumented immigran. One innocent misstep and she could be deported. But now, with the help of the Legal Services Program at UC Berkeley, Iwako has been granted a reprieve from deportation under a special immigration category created in 2012 for young people like her: Deferred Action for Childhood Arrivals, known as DACA. Just as importantly, DACA approval arrives with a work permit, allowing undocumented immigrants to receive a Social Security number and work legally for the first time, and to get a California ID card and driver’s license. DACA was announced by President Obama in summer 2012 as a stopgap while the federal government hashes out immigration reform. The temporary protection is valid for two years, but Obama held out the prospect of extensions for those qualifying. Iwako, who will graduate in 2014, is one of 103 Berkeley students whom Berkeley’s Legal Services Program has helped decide whether to apply for deferred action. Eighty-five were referred to volunteer attorneys for further advice and navigation through the process; the rest received help but were not eligible, did not want to apply or applied on their own. An estimated 200 undocumented immigrants attend Berkeley, and many of them are potential DACA candidates because they fall in the category known as DREAMers, those who have been raised and schooled in the United States. The name comes from the DREAM Act, federal legislation that, if passed, would allow certain young immigrants to become permanent residents. California has passed its own version, with active support from Berkeley Chancellor Birgeneau, allowing students to receive private and state scholarships. 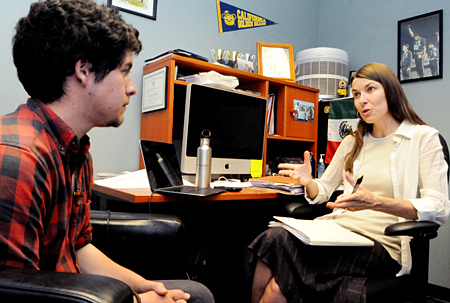 The Legal Services Program is one aspect of a broad campus effort to break down barriers standing in the way of qualifying students at Berkeley through the Undocumented Student Program. A small team of law students takes part each semester, led by Allison Davenport, a Berkeley Law graduate who worked as an immigration lawyer and served as legal- services director at Centro Legal de la Raza in Oakland before returning to campus as a clinical instructor in Berkeley Law’s International Human Rights Law Clinic. 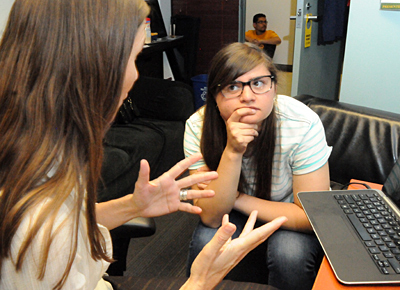 DACA went into effect last August and galvanized an existing immigration-related program in the Human Rights Clinic into a collaboration with the Undocumented Student Program. Davenport and the law students went to work spreading the word about the program through targeted emails and multiple workshops. Every Friday, the team has held office hours in the Cesar Chavez Student Center, inviting students to come in with questions and for help with documents. They’ve also built a panel of about a dozen Bay Area immigration attorneys, plus six nonprofit legal agencies, willing to work on the students’ cases pro bono. As the school year ends, most of those who applied for DACA have been approved and received the coveted work permit, which not only opens up jobs but also internships and graduate programs where one is required. Some applications are still pending, but no one has been denied. Much of the team’s work involves helping the students decide if applying for DACA is the right thing for them, and their families, especially since there’s no guarantee of what will happen after DACA’s two years are up. “It’s a big risk for students to come forward,” Davenport observes. “They have to give all their personal data, including fingerprints, to immigration authorities. It’s a big leap of faith. “You get into the system and the only way out is to be deported — or to eventually become a U.S. citizen,” she adds. For many, applying for DACA is the first time they’ve come out as undocumented. And students are making these decisions in a post-9/11 climate where detention and deportation of undocumented immigrants are at an all-time high, Davenport points out. Nina Smimov listens to Allison Davenport answer her questions about applying for Deferred Action for Childhood Arrivals. Her parents had immigrated legally from Japan when she was 2 and her father studied at UC San Diego, but, over time, the family failed to keep its visa renewed — and then the laws changed after 9/11 and the door slammed shut, Iwako says. All of this came as a shock to her in high school, when, after getting into Boston University, she went to apply for financial aid and learned her parents lacked documentation — a common story. Her father has since died of cancer that went untreated because he was undocumented. The family has lost its home, and its finances are dire. The California DREAM Act let Iwako come to Berkeley as a transfer student. But when DACA came along, she worried — not just about potential effects on her mom, but also about whether she’d be deported after the two years ran out and whether Obama would be re-elected, because Republican challenger Mitt Romney had threatened to end DACA. “What helped me was the belief Allison and her team had in DACA,” Iwako says. She heard of the legal program as co-chair of RISE — Rising Immigrant Scholars through Education — at Berkeley, and helped get people together for a workshop with Davenport and the team at Berkeley Law. She was referred to a private attorney among the program’s volunteers. And she went about compiling the documents required to prove that she had been in the United States since before she turned 16 and had lived here continuously since June 15, 2007, was under age 31 when DACA was announced and that she was in school and had graduated from high school or was a veteran. She also had to prove that she had no criminal record. It took a while. And then another potential barrier rose up: the $465 application fee. “That’s a huge sum of money,” says Iwako, who works as a waitress, pays the costs of living in Berkeley and helps support her family. “It’s a prohibitive cost for most of these students, especially those with siblings applying,” says Davenport. The Legal Services Program has been able to help most students cover the fee through a gift from Elise Haas, she says. Two years — then what? The morning of Election Day, betting that Obama would win and wanting to beat an anticipated flood of applications, Iwako turned in her papers. And she waited. First, the mail brought a receipt. Then, a fingerprinting appointment arrived. At the end of February, she got her work permit — and a measure of relief. 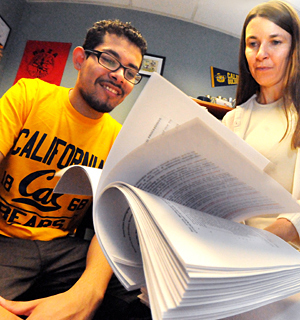 Looking through his sheaf of documentation, student Cristian Aguilar works with Allison Davenport to make sure he’s got everything in order. Not all students have proven able to apply for DACA. A few didn’t qualify. Some were found to be eligible for a more secure immigration status. Some students are still making up their minds or staying out of the process altogether, says Davenport. Political-science major Alma Torres went to a presentation at the law school last fall but, busy with classes, put off filing papers until just a few weeks ago. She had concerns, too. “My biggest fear was making a mistake with the documents” and being deported, says Torres. She also worried about confusion over her name, because she went by her middle name through high school. Time, plus two trips to office hours with the law clinic, and she was ready. She’s given her papers to her pro bono attorney with hopes her application is sent in soon, so she can qualify for a law office internship over the summer. Torres also wants to go visit her father, who has been deported to Mexico. For law students involved in the DACA program, like Diana Rashid, the work takes a lot of time but offers an education in notoriously complicated immigration law — as well as less tangible rewards. Rashid, who is graduating this month, plans to become an immigration attorney. So does Iwako. And Torres has her eye on law school, too, eventually. In the meantime, all three are doing what they can to push for immigration reform.